Chocolate Snickers Cookies have it all. They have the most wonderful crunchiness from chopped Snickers bars which, of course, are filled with peanuts and caramel nougat. Plus, since they are chocolate cookies to begin with you get that extra chocolate flavor that chocolate lover’s enjoy. 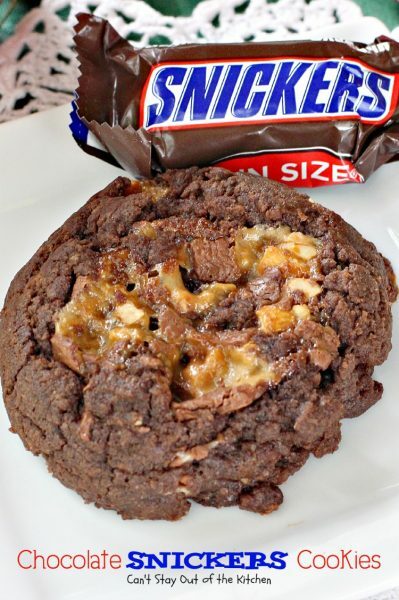 Since my husband had stocked up on Snickers bars for Halloween and we had BAGS of the stuff left over, it seemed a marriage made in heaven to combine a chocolate cookie with Snickers bars. Yes, indeed. Chocolate Snickers Cookies are awesome. I love baking cookies at this time of the year and can’t wait to share with you all the new and exciting recipes I tried over the past few weeks. If you’re looking for inspiration for your own holiday baking, then stay tuned to my blog for the next week or so as I post recipe after recipe after recipe of festive and beautiful Christmas cookies for your enjoyment! I had been thinking about ways to use up all those Snickers bars when John overbought for Halloween. Then I realized that John had Snickers bars stashed everywhere. No kidding. I found them in several drawers in our garage refrigerators, in multiple places in our pantry, and a couple of bags in his office. Well, I had no mercy. I scooped up all those Snickers bars (waiting to do a number on his waistline), and used up almost all of them when I made ten batches of this recipe for our Christmas cookie collection this year. 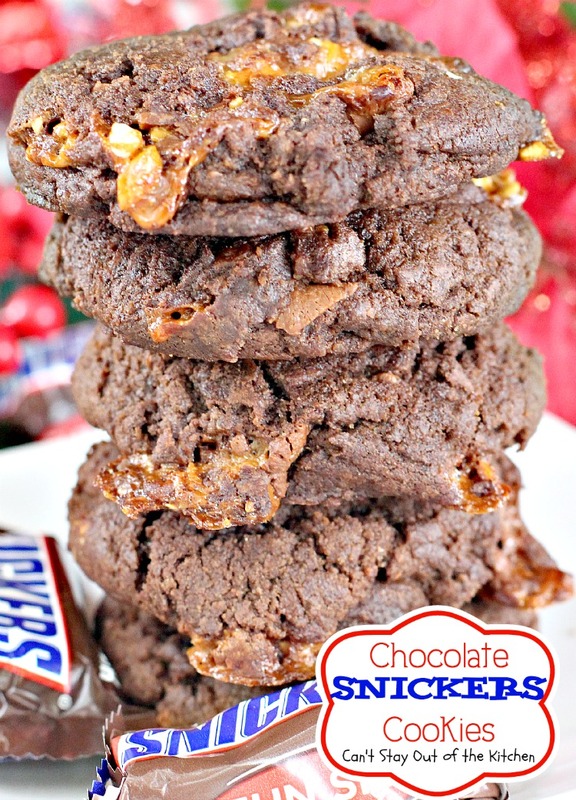 Chocolate Snickers Cookies are crispy on the outside and crunchy on the inside. 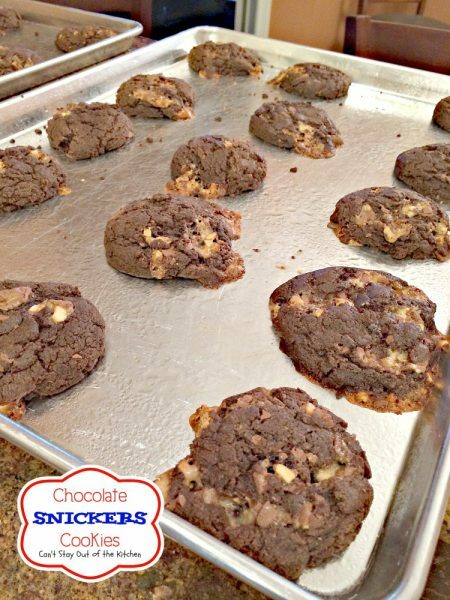 If your mouth waters at the taste of Snickers bars, you’ll love these cookies. 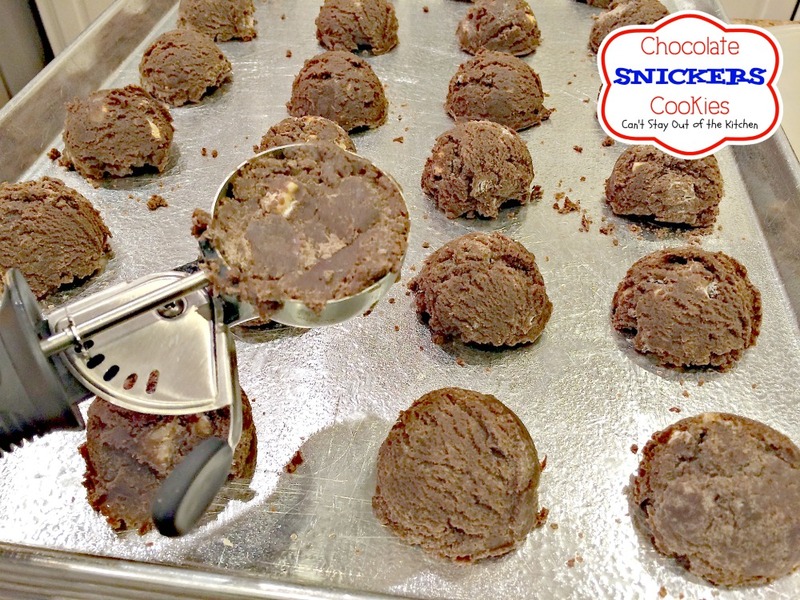 While I scooped my cookie dough with an ice cream scoop, these cookies can just as easily be rolled into balls. Because mine were pretty large, they took longer to cook than a normal cookie so keep that in mind when you bake them in your oven. The only time consuming thing about this recipe is chopping up the Snickers bars. Other than that, they’re pretty quick and easy. Why not give them a try this Christmas? Chocolate Snickers Cookies are outrageous! 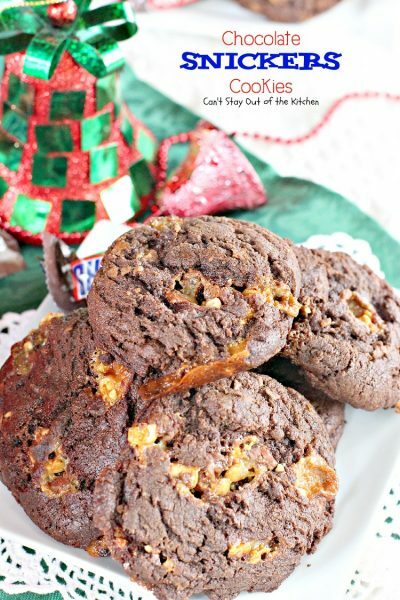 Your family will love eating these amazing cookies this holiday season. 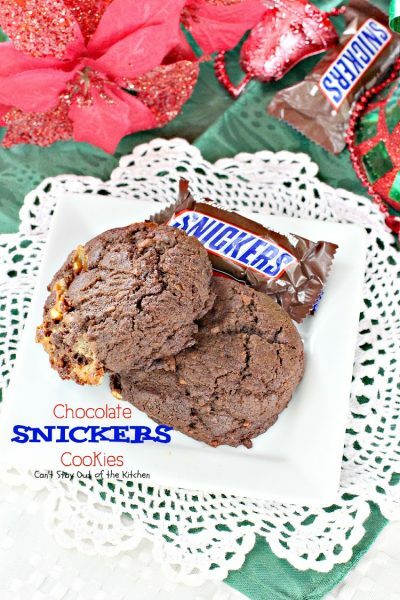 Each cookie is filled with chopped Snickers bars. Yum. 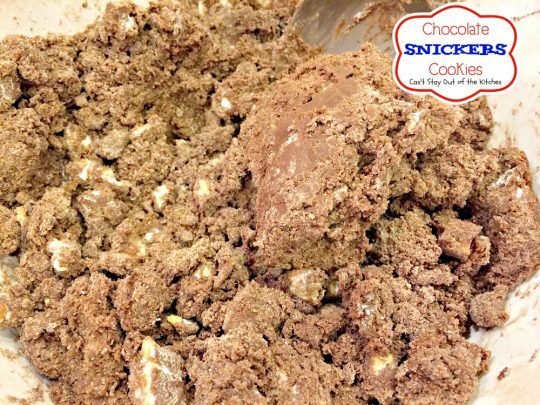 Making a batch of Chocolate Snickers Cookies is a great way to use up all that leftover Halloween candy. Soften butter. 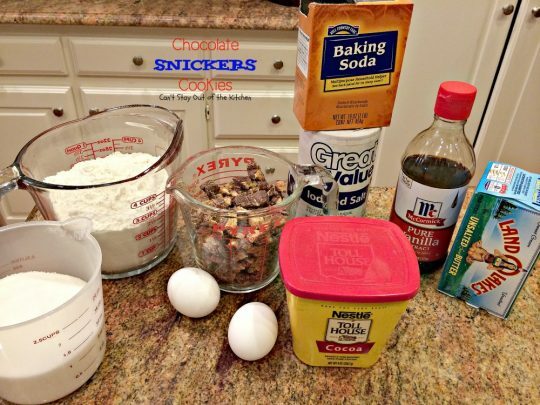 Add sugar, cocoa, eggs, baking soda, salt and vanilla. Mix ingredients with an electric mixer until creamy. Add UNBLEACHED all-purpose flour. Bleached flour toughens baked goods. 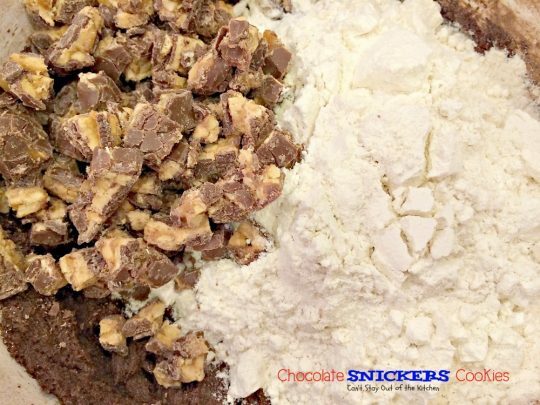 Add chopped Snickers bars. Stir mixture very well with a wooden spoon. Spray cookie sheets with cooking spray. 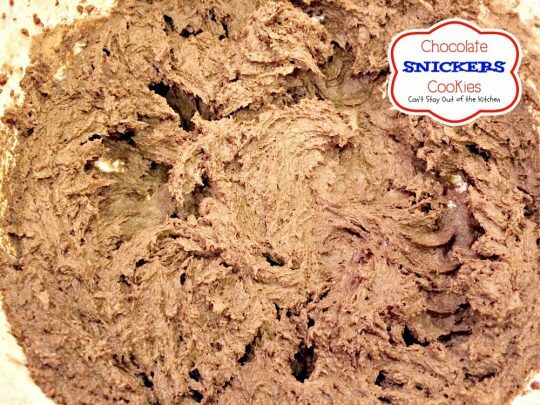 Scoop dough with a one-quarter cup ice cream scoop and place on greased cookie sheets. You can also roll the mixture into balls. Bake at 350 for 15-20 minutes or until cookies test done. These were whopper-sized cookies so they took longer. Check your baking time. If you are only cooking one rack at a time these may be done in 10 minutes! 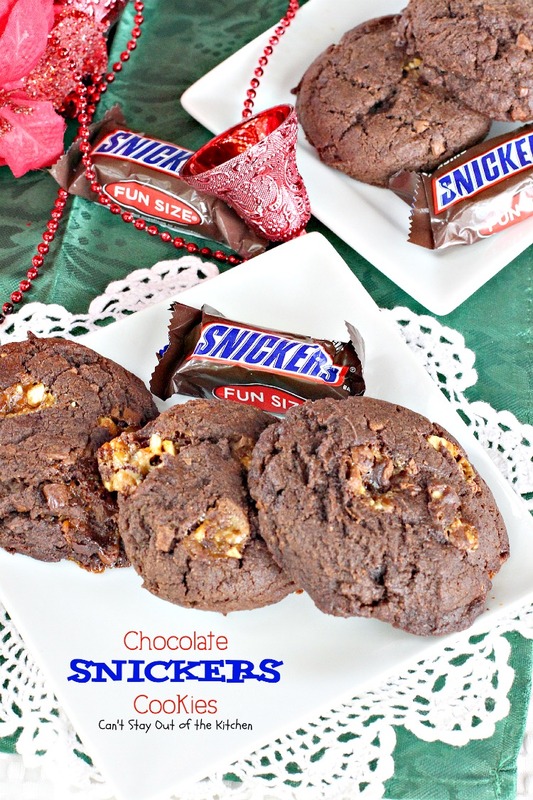 Chocolate Snickers Cookies are great for Tailgating and Super Bowl parties. 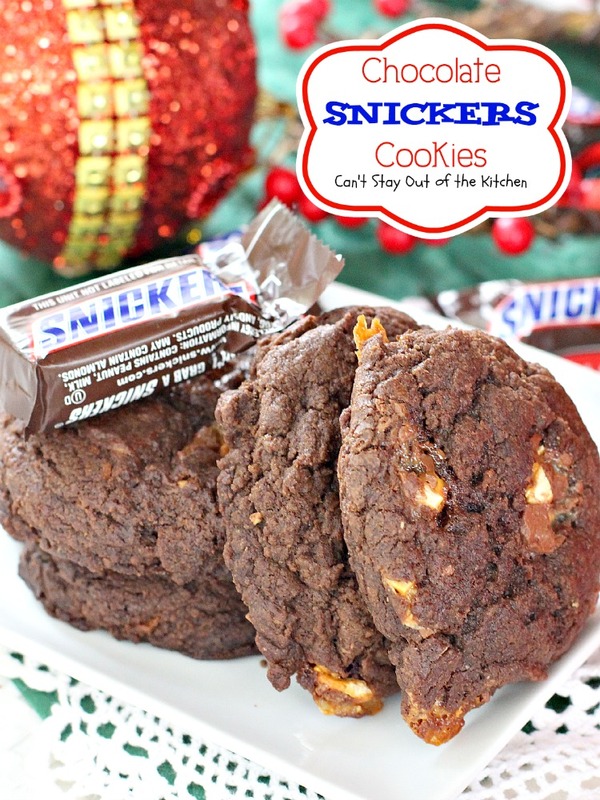 Every bite of these lovely chocolate cookies is filled with chopped Snickers bars providing wonderful peanut butter and caramel flavor. These lovely cookies are filled with Snickers bars providing a wonderful, crunchy peanut butter and caramel nougat-flavored taste in each bite! Great for tailgating or holiday baking. This is also a great way to use up leftover Halloween candy. Cream butter, sugar, eggs, vanilla, cocoa, baking soda and salt. Stir in UNBLEACHED all-purpose flour and chopped Snickers bars. Scoop cookie dough with a one-quarter cup ice cream scoop and place on cookie sheets that have been sprayed with cooking spray. Bake at 350° for about 15-20 minutes or until cookies test done. Cool 1 minute before removing from cookie sheets onto wire racks. 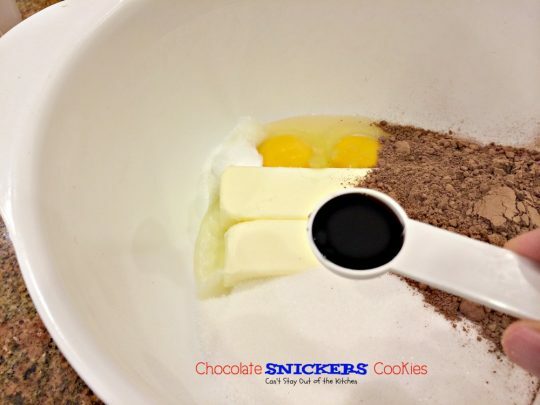 NOTE: Be sure you do NOT use a dark pan to make these cookies or the reflection causes them to scorch on the bottoms, yet not be baked thoroughly. NOTE: These cookies were whopper sized. If you make smaller cookies they may take less time to bake. I was also baking 5 racks of cookies at a time so mine took longer to bake. NOTE: You can also roll cookie dough into balls before baking. Be sure you do NOT use a dark pan to make these cookies or the reflection causes them to scorch on the bottoms, yet not be baked thoroughly. [br][br]These cookies were whopper sized. If you make smaller cookies they may take less time to bake. I was also baking 5 racks of cookies at a time so mine took longer to bake. [br][br]You can also roll cookie dough into balls before baking. 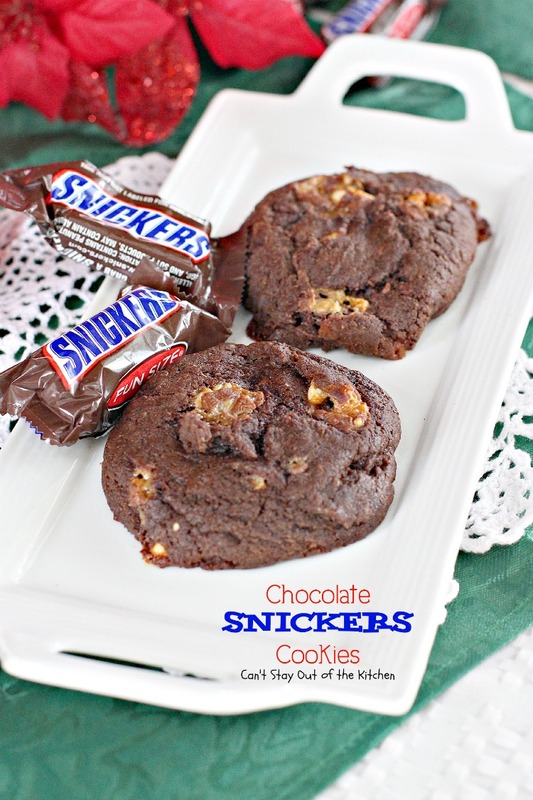 Chocolate Snickers Cookies are great for Christmas cookie exchanges or any holiday party. Don’t Chocolate Snickers Cookies look marvelous?